The L1 Model I Dual System/Dual Bass Package includes two Bose L1 Model I Cylindrical Radiator Speakers, two Bose L Model I Power Stands, and two Bose B1 Bass Modules. The L1 Model I Cylindrical Radiator Speaker is an integral component of the from Bose L1 Model One PA system. This innovative system projects clean, detailed sound evenly across the stage and throughout an audience of up to several hundred, with little change in tone or volume and eliminates the need for conventional monitors, mixers, and PA speakers. It is the ultimate in fidelity and is extremely lightweight and portable. The unique Cylindrical Radiator loudspeaker comes in two sections and has a line array of 24 small drivers mounted into a vertical speaker enclosure for wide, horizontal sound coverage. This proprietary design helps fill the room with clear sound like no ordinary audio speaker can. In comparison to a conventional speaker, volume and tone diminish very slowly over distance. The loudspeaker's wedge-shaped dispersion pattern sends little sound to the floors, upper walls and ceilings, minimizing room reverberation and increasing clarity. In contrast to a conventional setup, the Bose L1 system lets you, your fellow musicians and the audience hear the same sound. You don't need any other stage monitors, mixers or PA speakers. 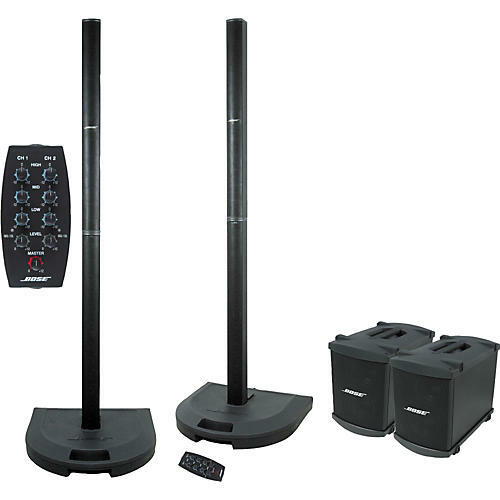 The L1 system replaces them all with one sleek, powerful setup. The L1 Cylindrical Radiator loudspeaker features a two-piece, interlocking design for quick and easy transport, setup and breakdown. Each section of loudspeaker is 43 1/2" (1.1 m) high. It includes an interlocking bayonet with center and bottom latches. Provide clean, precise amplification for L1 Model I loudspeaker and up to two B1 bass modules. Musicians can play soft or loud with confidence the system will accurately amplify their performance. Primary mic/line input channels 1 and 2 accept XLR and 1/4" TRS connections; they feature ultra-low noise preamps, two-stage clip lights, trim controls and XLR line-out channels. Secondary input channels 3 and 4 accept 1/4" unbalanced line-level sources like keyboards, sequencers, mixers and MP3 players. Proprietary ToneMatch presets optimize Bose L1 system to match intended natural sound of specific instruments and microphones on channels 1 and 2. Select presets independently for these channels using pushbutton controls. Connect channels 1 and 2 to external effects and processors via 1/4" TRS line input/output connections. Use a stereo plug to connect the send and return signals with one cord. Delivers amplified bass output signal to one or two B1 bass modules. L1 speaker system automatically adjusts equalization appropriately when bass modules are connected. Post-DSP bass signal output. Accepts 1/4" TRS phone cable. Use to connect PackLite amplifier with up to two additional bass modules. Can also be used to connect powered subwoofer or additional amplification system. Send digital mix of channels 1 and 2 to external recording gear at 48KHz sample rate. Update product software and ToneMatch presets via this digital input connector. Seven-pin connection works with R1 remote control( sold separately). The Bose B1 Bass Module works seamlessly with the L1 Model I PA System to deliver the low-frequency impact you want through 2 high-output, high-excursion 6-1/2" drivers. It produces deep, strong bass for keyboards, kick drum, bass guitar, and other instruments that play in the baritone/bass range. Light and compact, strong bass is yours without the bulk and weight of traditional subwoofers. Connects to the PS1 power stand with a single cable. 5 year warranty on all pro gear (speakers and amps). Warranty terms vary on other products. Check with manufacturer for specific product warranty.